The Blend BossTM is a stand-alone chemical blending station that will allow for up to a three product in-line blend of nearly all liquid de-icing chemicals. 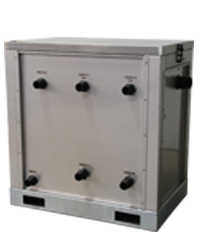 This groundbreaking unit can be installed with any new or existing tank farm. 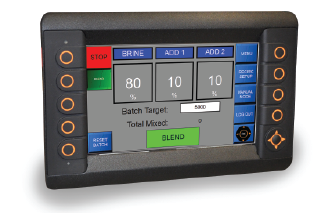 Quick and accurate volume based blending can now be accomplished with the touch of a button. 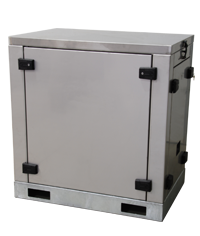 All plumbing components are enclosed in a stainless steel enclosure with a rugged, galvanized steel base. The control panel and remote fill pendant are enclosed in NEMA rated enclosure to withstand the harshest winter environments. Ability to make “hot-mix” blends using nearly any de-icing chemical. Make changes to your blend before or during a storm depending on precipitation and temperate changes. Fill the truck as needed – no need to store a premixed blend in a storage tank prior to an event. This also eliminates the “layering” effect associated with a manual filling process. Prevents any unauthorized changes to blending target rates. Ensures fast, efficient blending with an automatic shutdown once the target gallonage has been met. Allows for off-season recirculation of tank farm to prevent material settling. Corrosion resistant material needed for transferring abrasive materials used in anti-icing applications. Ready for use by simply supplying power. Prevents kinks and hose collapse for added system reliability.